Decay! At least for the trees, the leaves come back again in spring. The way the doors are open adds to the mystery of this shot. Good one! 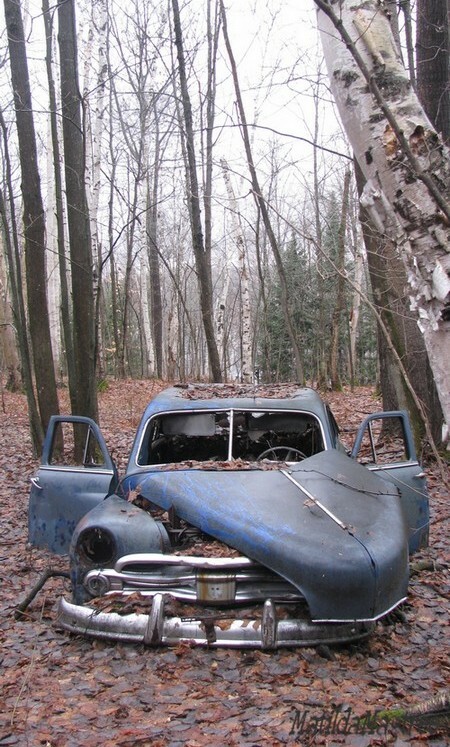 I’ve seen abandoned cars before but this shot is unusual — the way the hood is askew and the doors are open. It looks almost animate. And it’s like the car is slowly drowning in leaves. You know it’s uncanny — I was thinking of posting a photo of an old car myself this Wordless Wednesday, but I’m glad I didn’t because yours is better. You have such an eye, Carin. I know. The doors and the hood. Very crazy. And it’s right in the middle of a thickly wooded area. Am assuming it was once a field that grew up around it over decades. Would so love to know the story behind this. Making one up just won’t do it for me!